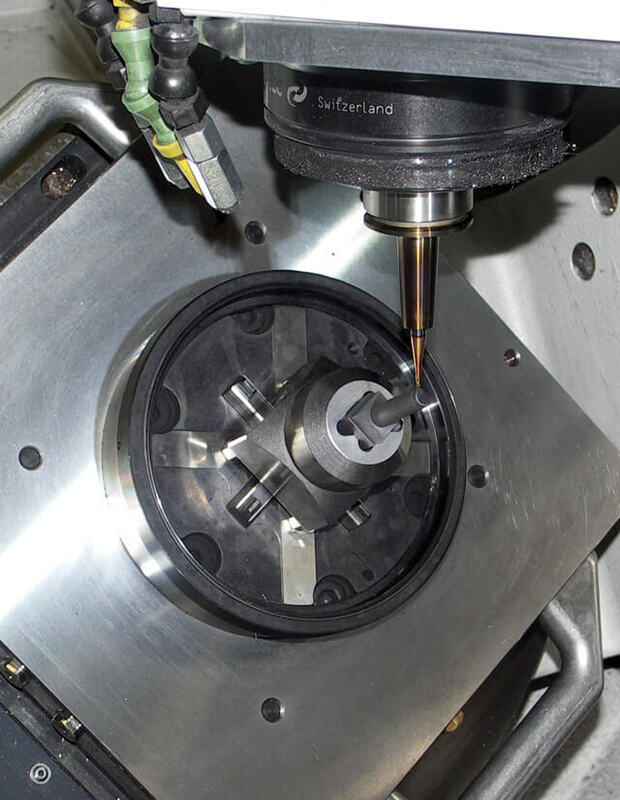 GEMÜ in Ingelfingen, Germany, uses the expertise of its toolmaking people for the manufacturing of innovative valve, measuring and controlling systems. Not only is the highest possible surface quality important, but the toolmaking department has long seen itself as the “tool production department” for GEMÜ’s own needs and as a partner for outside customers. It’s all about the fastest possible door-to-door times and the highest possible productivity. Fast 5-axis simultaneous machining with an Exeron HSC 600 milling machine, controlled by a HEIDENHAIN iTNC 530, plays an important role here. 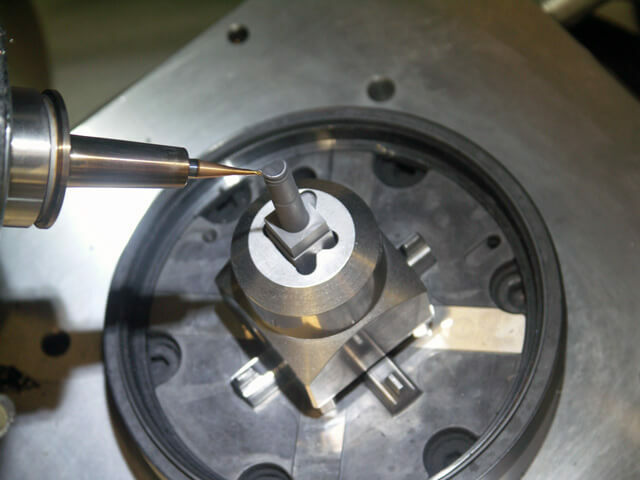 For some time now, direct High Speed Cutting (HSC) has been gaining in importance compared with classical die-sinking EDM. Precise control of the enormous acceleration and deceleration processes along a programmed path is a prerequisite for fast, accurate contouring. The path control of the CNC control has a decisive influence on the optimization of machining times under given requirements for accuracy and surface definition. One of the GEMÜ tool production department’s responsibilities is still the manufacture of electrodes for use in EDM machines. And many of the electrodes take up to 30 minutes of machining time, of which tool changing represents a considerable share. Productivity will be increased even further by a pallet system that will be installed in the upcoming months. Ralf Herrmann is also thinking about integrating HSC milling machines in the production process in order to manufacture serial parts and save on polishing. After all, the GEMÜ tool production department is both a test center for future technologies and it prepares for serial production. 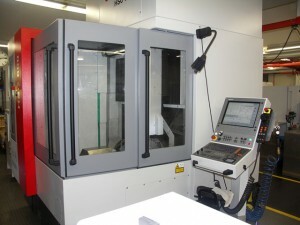 With the Exeron 600 HSC series, controlled by the HEIDENHAIN iTNC 530, GEMÜ has a good horse in its high-tech stall. Collision monitoring has become an important feature at the feed rates involved. GEMÜ has found the function to be very reliable—even in manual operation! Then there’s the gain in accuracy thanks to KinematicsOpt. Rather than editing the NC program, this feature of the iTNC 530 adapts the kinematic model saved in the machine. Changes in the kinematics are measured and, if desired, automatically compensated with the aid of a high-accuracy HEIDENHAIN touch probe and the absolutely precise HEIDENHAIN calibration sphere. With this compensation information for recalibration, which takes only a few minutes, the machine can move the tool more accurately along the programmed contour. The error of the calibration sphere center is logged for all rotary axes, and statistical evaluations inform the user whether the required accuracy can be maintained through recalibration or whether an entirely new calibration is necessary. To really understand how up to five axis move simultaneously, to always know which zero point has to be active for which side, requires a great deal of skill and demands your complete attention. This is where KinematicsOpt helps: the user only needs to place the calibration sphere correctly on the machine table to be able to machine precisely in the long term or to reduce running-in periods. The high feed rates in HSC machining inevitably require higher axis accelerations on curved workpiece contours. Each machining task must be performed so that highly dynamic movements do not cause disturbance from machine vibration and reduce the quality of workpiece surfaces. 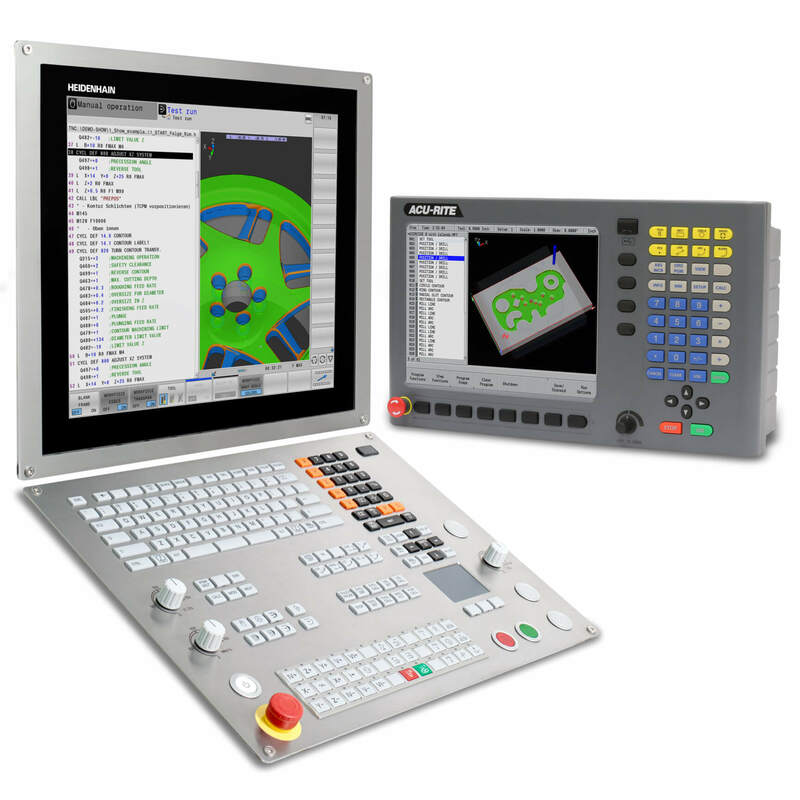 Motion control for 5-axis machining places especially high demands on the control. At the same time, the machining time has to be minimized and the surface definition optimized while fulfilling given accuracy requirements. To keep the production times in an acceptable range, freeform surfaces are frequently milled with path directions reversed between passes. Meanwhile, the control must generate reproducible tool paths when approaching contour elements from opposing directions. The deviations between adjacent milling paths must remain significantly smaller than the defined path tolerances. NC programs for free-form surfaces are usually created with a CAM system and consist of simple line segments. 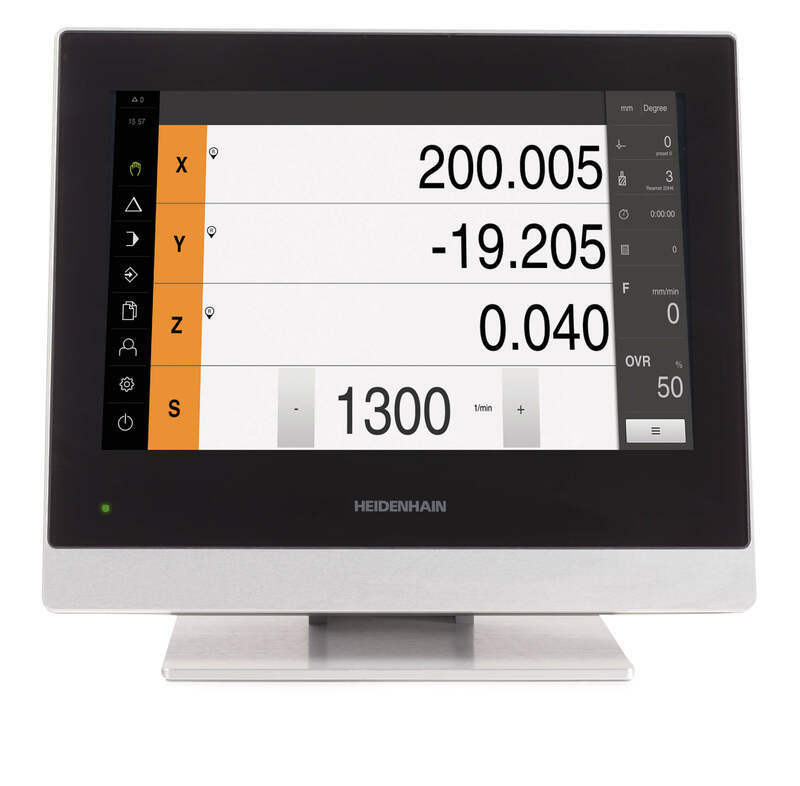 HEIDENHAIN controls automatically smooth the block transitions while the tool moves continuously on the workpiece surface. This automatic smoothing is controlled by an internal function that monitors the contour deviations. This function (Cycle 32) enables the user to define the permissible contour deviation. Without smoothing of the nominal path data, the axes of the machine would have to accelerate abruptly at the transition points. The resulting jerk would excite intensified oscillations of the machine. Contouring deviations would inevitably occur that, depending on the change of curvature and path velocity, would reach dimensions that cannot be tolerated in micrometerprecise machine tools. The path control of the iTNC 530 smoothes the jerk and complies with the given contour tolerance even with strong changes in contouring speed. From the very beginning, more economy, consistent, reliable product quality at affordable prices and more benefit for the customer were the motives for industrial valve manufacture at GEMÜ. The invention of the world’s first directly controlled electromagnetically actuated seat valve made of plastic (PVC) in 1963 enabled design engineers to take their first economic steps toward automation in the field of galvanic systems. 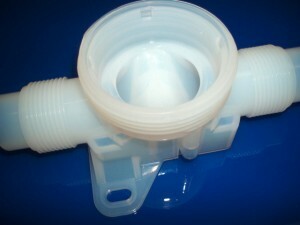 In his parents’ garage and kitchen in Ingelfingen, Germany, Fritz Müller manufactured the first of the plastic process valves he had invented. This was followed in 1977 by the development of the plastic variable-area flow meters in the GEMÜ 800 and GEMÜ 850 series. One important milestone in the company’s development was the inauguration of the new GEMÜ DOME innovation center in January 2009. Today, GEMÜ enjoys great respect as an innovative, owner-managed company with over 400,000 product variants and 12 subsidiaries worldwide.